In this video clip from last night's episode, the Duggars head to the regional airport to surprise Jill, Derick, and Israel Dillard, who are coming home for a four-month visit. "Nobody wants to miss out on this," says Josiah. 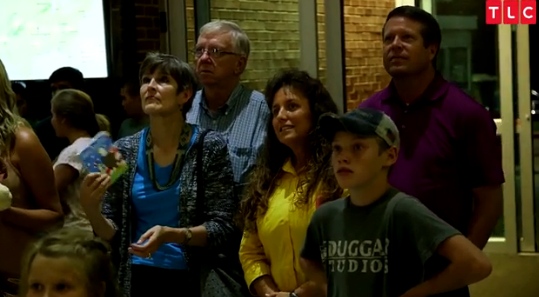 The group is all smiles as they patiently wait for the Dillards to appear at the top of the escalator. While Jim Bob and Michelle and some of their older kids have made visits to Central America over the past 10 months, many of the younger Duggars have not seen Jill and Derick since last October. So what is Jessa's big announcemnt? That she is pregnant? Is that the "surprise"? Really????? We knew that weeks ago. I'm sure its blessing to have The Dillards here on furlough. Since we don't have cable and can't watch the show I was wondering, are the shows shown in order? They seem like they are but maybe I'm wrong? Glad they are home safe and enjoying the family. It was so sweet Jana made such an effort to freshen up the house. Amused by Ben and the babysitting. Having two close in age can be a busy challenge. Ben and the Duggar girls did all the babysitting while Jessa sat there! Funny how the little girls are brought in to work under the guise that they love to help. Hmnn. Start them young with a glimpse of what the future holds for them? I love what u guys are doing in central america but i think u should not risk the life of your baby. God loves all his kids. The welcome signs are so childish. And so "Everyone else online is doing it so I will, too!" Suddenly every event in life requires a chalkboard and a message. I loved the grocery store date between Jill and Derek. So cute! I love that they defined what there date was (not what is considered the norm), and they didn't care what anybody thought about it. (A nice, big grocery store can be a fun place to go - especially when you haven't been in one like that in a very long time and you can take your time without any distractions - so I get it). Had to comment because I Loved it! How is going grocery shopping a date? There is nothing romantic about shopping for baby items and food. Exactly my point - they were not doing what you or even I would consider the norm. Our identity is in Christ and when we can remember that (me especially needing to) there is a lot we don't do (or shouldn't do) that is the norm. I do so agree…!.. You would think that if Jim Bob and Michelle knew what kind of shows were on TLC they would go elsewhere ..
Jim Bob and Michelle know perfectly well what goes on with TLC. So which do you think is more important to them in this case - getting paid, or refusing to be associated with that network, on general principles? I think you got the answer in one. Just add that to the pile of other disappointments. Did they have to take THREE vehicles to their regional airport? Most of them have seen Jill and Derick many times in the MONTHS they have away, it's not been years for all of them. I also noticed Jill and Derick immediately had a white van at their disposal as THEY drove from the airport. Now, is that necessary? It was nice of them to allow Derick's mother and brother a moment to welcome them home...after all, Dan hasn't been flying down there every other week to see them. This clan is abrasive and hogs up everything without little or no real regard for others. When Derick returned from Nepal, (after just meeting him and not even "courting" yet) it was SHE who was front and center at the airport and all of HER family. Derick's brother and step-father were delegated to the rear. I think most of this is for TLC. It becomes an event to film. If TLC was out of the picture, maybe Jana or JB would have gone to pick them up, period. Why not wait at the house for the party rather than cart them all to the airport. Again=TLC event. I disagree. I think they are a close family, and a big event like Jill and Derick coming home (especially from an unsafe area of central america) was a BIG DEAL. I believe they all wanted to be there and give them a gigantic, happy greeting. It looked like Jill and Derick liked it and appreciated it; I am sure it made them feel special - seeing most of the family there when they got off the plane. So I believe even if TLC had not been there they would have all still went to the airport to greet them. I am sure this is not the first time they were all or most at the airport when someone had been a way so long. We have seen scenes before where the entire family has not gone to the airport (maybe a few of them). So I don't think it was just a TLC thing at all. What I derive from the Dillard's is they are very frightened to be in the area and do not want to go back; Jill looks quite anxious about continuing staying true to this mission story line and Derrick just looks sickly. I agree. They will find something new and explain that they think this is what God wants them to do (new child, new work here, etc.) How nice they get that gorgeous mansion to live in, with all electrical and other bills paid by JB I'm sure. They won't want to leave that any time soon. Anon I agree. They might prefer to do mission work in the U.S. I have grown very fond of Jill and Derick and want the best for their little family! But I agree that it appears that Jill especially is frightened and has suffered, and I hope she gets the rest and rejuvenation she needs while home. It just might be too much for a young mother with a toddler to protect to handle the kind of daily fear they have experienced. My hope is that they reconsider staying in this country and using their talents to serve here. I love the Duggars but have always wondered why Jill gets to live in these huge guest homes and Jessa gets stuck in the 900 sq foot home? Jessa got married after Jill so maybe she got leftovers? The answer, of course, is for Ben and Jessa to work in jobs where they can afford to pay for their own house, not get handed one from Dad and/or TLC. I agree completely. Jessa must be a bit sad about that. It doesn't seem fair, especially if she will have 2 kids and Jill have just one. How about they use their TLC and SOS pay and buy their own house or Ben/Derick get full time jobs other than TLC. Truly leave and cleave. I don't see that happening. JB commented when Jessa moved in that he allowed his kids one year to live in one of his homes. He has exceeded that for Jessa, I don't know why. Sadly, Jill always seems to get the best. Why isn't Anna in the biggest house with 4 kids. Wow. I have a feeling there isn't enough privacy at that house for Josh & Anna to be there right now. They have to be somewhere hidden away on private property, or the photographers for the tabloids would have a field day trying to peer into windows or stalking the property. JB shouldn't be involved in where his children live. Ben was so young and hardly prepared to support a family. Derick and Jill should have gone off on their own. Seems the married daughters really cling to the family instead of being more independent of their parents. Where does Michelle find her brightly colored blouses? They like thrift store shopping. Mister Byrum always looks miserable. Why is that? Who is Mister Byrum? .? Mr. Byrum is Cathy's husband, Derick's step father. Y'all, I don't think it's ok to be disrespectful to the Duggars here online, or anywhere for that matter. Everybody has their own preference on what they like and don't. I don't think Ben and Jessa are trying to copy anyone by using the chalkboard or whatever they use to show they are pregnant. It is a very exciting time in their lives! We should all be supportive and respectful to what they chose to do, besides is any of it going to hurt you? If not, don't worry about it. And I also don't think Jill and Derrick are not concerned about Israel in those conditions. It has been proven on their shows that they are truly concerned, but they feel the need to do what God has called them to do. God won't let anything happen to them, and if He does it is for a reason.